Anyone has some advice to check the setup? Last edited by e-vektor on Aug 15 2018 5:03pm, edited 1 time in total. Turns out the torque is quoted at engine crank and not alternator. Are you pushing the full current that the Curtis can produce through it? That explains several things. I got the whole torque (160 n*m) in the brake which has similar ratio to the alternator with respect the engine in the car. I am struggling measuring the efficiency of this motor (battery power vs mechanical power), but I am getting very bad results. For low speed values, say 300 rpm, I am getting values of 30% eff or so. And for values close to the nominal speed (850 rpm at 75V) efficiency with different current values go from 50% to 55%, no more. I would have expect to have at least 80% at higher speed / low torque areas, but not, it is always below 55%. I tried different slip gain values, and the value that creates more torque is 16%, although Curtis set it to 9% after self-tune. Of course the more slip, the less efficiency, although in a narrow range. Some ideas? is there some way to run the Curtis 1236 to drive the motor in a more direct way? 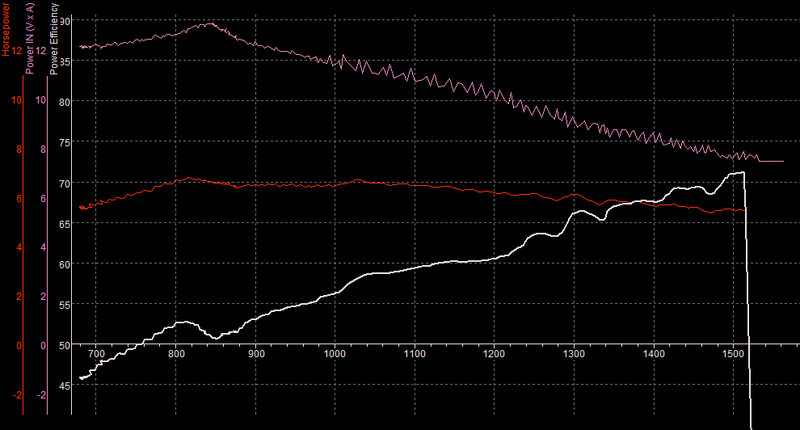 a quick update: by now I recalibrated the dyno, now it shows +15% more torque, this makes that efficiency is now between 60% and 65% in most cases. And some of them (I cannot repeat) close to 70%, but no more. I had expected to have at least 80% in wide areas, but it is 60%. should I expect more from this motor, or I definetively assume that this is its maximum? 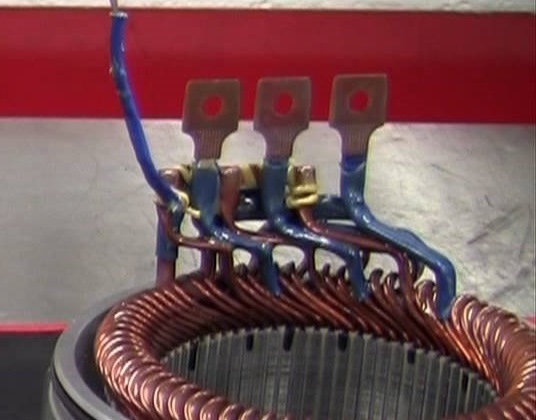 The motor can probally take more voltage or more current. If you want to find out what it can take just start raising the voltage to the limit of the controller. Why are you using such a low voltage controller? For short bursts you van easily get the motor to take more current, did you hook up cooling and are you measuring the temperatures? battery voltage and controller were a bad decision at the begining of the project. Anyway this motor can be reconnected to delta, then 115V (star) is equivalent to 66V (delta), so I think I will be able to test it more propertly. Indeed in some efficiency maps I saw on the Internet, max efficiency only happens at higher speeds when high field weakening is being active. Is there any possibility of drilling and setting a number of small pill magnets into the rotor and turning this into a PMDC motor and using a Lebowski chip modded controller like the IMA or a Volt controller ? These motors are readily available and cheap, and can be water cooled to control the heat as I believe might be your intension. Thanks to Justin, the forum is open source and NON-commercialized. But in this case my interest is controlling an induction motor because I thought that it had some advantages at high speed range and good power density, although I have to admit that by now it is being a little frustrating and disapointing as efficiency is very low. I posted in another forum, about changing to PM, but, was told it won't work well. Are you still playing with AC ? Do you plan on doing a home brew controller, similar to Tomdb ? I am going stateside next week and can purchase used items reasonably. Just don't know squat about electronics, yet. I DID buy a recommended book, though. I'm very interested in this for low voltage, 120V or so for moto conversions. i think that running it at partial load (thus partial amps) will result even higher efficiency, oops noticed you did run lower load . 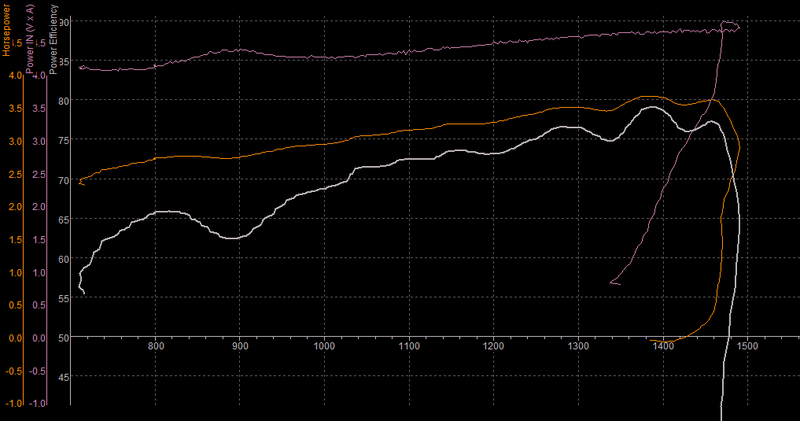 Also the efficiency is measured at the dyno brake, what is between the motor and the dyno that could result in losses? This motor would be a good match for the Johannes Huebner inverter kit plus a honda IMA powerstage. Harold in CR wrote: I posted in another forum, about changing to PM, but, was told it won't work well. Are you still playing with AC ? Do you plan on doing a home brew controller, similar to Tomdb ? I think that for this motor the magnets modification can be difficult as it has 72 stator elements, but I don't know if this means 72 magnets, or just 8 magnets as it has 8 poles. Anyway it seems too much work, and I want to experiment ACIM motors. Yes, I would like to build an inverter, but I am not sure if at this moment it makes sense as there are big amount of open source projects. Anyway, I don't think I am going to use another motor, at least for this project. Tomdb wrote: i think that running it at partial load (thus partial amps) will result even higher efficiency, oops noticed you did run lower load . yes, I am trying to create an eff. map, anyway the expected values at low torque / low speed areas are also low. The only area that seems good by now is the field weakeing area at low torque, like in this picture, in which the F.W. effect is very noticeable. A motor like this one should be ran with a very short gear, always in the F.W. area. 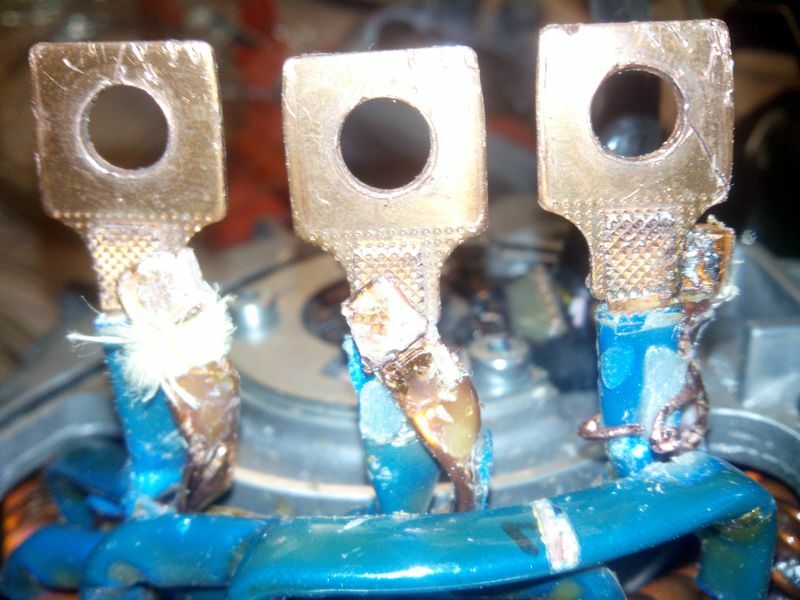 Are you aware of tomdb thread Honda IMA on diyelectriccar.com ? It should be good up to 180V at 400 A I believe. Having trouble remembering all the details of various threads. He is also working on another higher voltage inverter Chevy Volt/Ampera, also on diyelectriccar.com. Slide on over to that site and look under Controllers if you are not aware of his threads. Chain is only efficient at low speed, high load conditions, everything else must be included in equation, for any meaningful results. Harold in CR wrote: Are you aware of tomdb thread Honda IMA on diyelectriccar.com ? It should be good up to 180V at 400 A I believe. Having trouble remembering all the details of various threads. No, I am new at this. I am searching some semi-professional solution, as Curtis prices get high for the 144V model, and I already have the 80V model. But the idea of using stock parts seems interesting from the point of view of costs, although I think the MCU and software should be written from scratch. If you are using the e-assist motor, they are AC induction. I wanted to convert one to PM, but was told it won't work. No worries about being new at this, I'm green as a gourd myself. I'm just stumbling along and hope I don't say things that are not correct. I just read a bit ago, that tomdb has the Chevy/Ampera inverter working well. The idea behind taking an OEM controller is taking just the expensive bits, so the powerstage. Capacitors, Igbts, drivers and current sensors. Then you hook up your own flavor of controller, currently aware of the Lebowski variant for BLDC position sensor less or with hall and the Johannes huebner http://johanneshuebner.com/quickcms/ind ... ter,8.html who can do acim or BLDC but both require position sensing. I currently have the Honda IMA system worked out to a good degree and indeed also now the Chevy Volt inverter (complete overkill this one for this motor). But this road will require some electrical knowledge and soldering. Yet the parameters under your own control grow exponentially when you go to a more diy solution. I'm pretty sure Paul has an ACIM firmware for his control board. You could get Paul to build you a board of his, then Tom has already worked out the rest of controlling a 2nd/3rd gen IMA inverter. Others have done the first gen IMA inverters (round caps vs. the one with the cap as an enclosure) and apparently they are easier to drive than the version Tom and I have. In another thread, tomdb gave me a rough price of materials to build a Honda IMA inverter. These e-assist motors can be had for $100.00 and up, and the price est. was $400.00 or so. Figure $1000.00 for all materials and motor and this MIGHT make a reasonable priced moto conversion possible. I would be in for trying to build an inverter with some assistance along the way. If e-vector would like to try, that might get a couple more involved, and be a very educational thread for future builders. I'm reasonably certain that the Lebowski chip works with tomdb's inverters. There is a guy (whereswally) that has boards for sale and the Lebowski chip comes programmed, and the newest version can be programmed without sending back. Both can be found on endless-sphere website. I don't know prices yet. Still watching to see if anyone else wants in and maybe order several boards and chips as a group thing. Mine would be sent to USA, Florida. The motor I have now is a 6 phase brushless and needs 2 controllers, so, added costs to use this motor and, these 6 phase motors are not cheap like the e-assist motor.